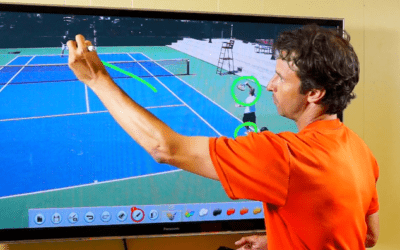 Today we are talking about your tennis approach footwork on the slice backhand. 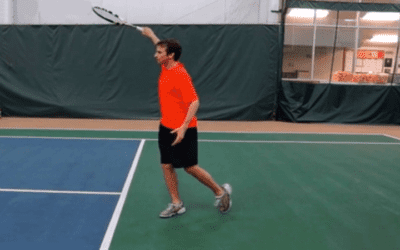 There are a few different footwork patterns to use on the slice backhand approach shot. Today I want us to focus on the carioca tennis approach footwork pattern. The reason I love the carioca footwork while approaching the net is because it keeps you moving forward through the ball. I am all about continually moving forward while you hit your approach shots. There are too many players who slow down or stop to hit the approach shot. 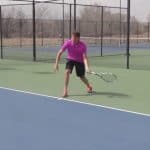 You can also use the carioca footwork in other aspects of your tennis, so make sure to learn this footwork pattern. To use this footwork pattern, you’ll step in to the ball with your font foot. Then your back leg will start coming behind your front foot as you hit the ball. This allows you to move forward ays hit the ball and comet attack the net. After your back foot comes behind the front foot, your front foot will now continue to move forward as well. You don’t want to stop your momentum after your back leg comes behind your body. Many players makes this mistake, but the key is to flow through the shot with this tennis approach footwork pattern. To get the feel of this pattern you’ll want to use a 1-2-3 rhythm on the carioca. Stepping in to hit the ball will be #1…the foot coming behind the body will be #2, and the front foot coming through again will be the #3. Use the Carioca footwork pattern when you it slice backhand approach shots the next time you are playing tennis. 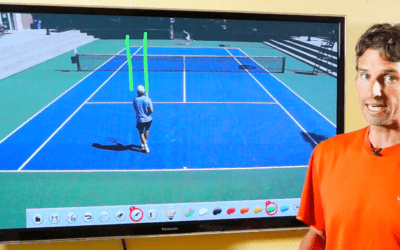 Click here to discover another powerful tennis approach footwork video lesson. I have always enjoyed and benefited from the free on-line lessons as well as the units that I have purchased. I am a 59 year old 4.0 player looking for some camps this winter and was wondering what you would advise. I am not competing in anything but would like to improve and get out of the snow. Hi Gerry, That’s a good question. Have you looked Saddlebrook? Also Jeff Greenwald and I do an awesome Fearless Tennis Experience March 31 and Sept 16 for 3 days each time. If you want transformation, you would love it. You can email me at [email protected] for more info! Thank you! Thanks for sharing, Bruce! Great options.